I’m in Cardiff today and have just been for a walk into town and back. It’s a lovely sunny springlike day with a temperature of around 13 degrees. There’s an abundance of daffodils in Bute Park. Although the match doesn’t start for several hours, all the main roads are already closed so you can stroll around the City without worrying about cars. There’s a lot of people crammed into town, but a very good atmosphere around the place. I haven’t got a ticket for the match and don’t feel like watching in a packed pub either so I’ll just follow it on the radio. After two impressive performances so far this year, England are probably favourites but you never know! They have also won the last five Six Nations matches between these two teams. But with their home crowd behind them Wales might well bring England’s run to an end. I’ll make only one prediction: it will be a very physical game. UPDATE: I was certainly right about it being a physical game! But a strong second-half comeback against a tiring England gave Wales victory by 21 to 13. Diolch, Cymru! My blogging activities have been a little thin over the last few days as I’ve been in a race against time to submit a grant application. The deadline for that was 4pm today. I was advised to submit it `in good time’, however, and managed to do that. The electronic submission receipt is time-stamped 3:59:47. I guess that’s what they call `Just-in-time Delivery’! It’s my first attempt at a grant application in the Irish system and I had very little notice of the funding call. It took me quite a while to figure out how to construct a budget using rules that are different from the UK, and that left me relatively little time to write the science case. I cobbled something together but don’t expect it is coherent enough to get funded. On the other hand, I might get some useful feedback on what to do better next time. This approach doesn’t work in the UK system, because for many schemes there you can only apply once every three years. Anyway, to get a break from grant-writing yesterday evening, I strolled around my local in Maynooth for a pint and to watch a bit of the World Cup Semi-Final between England and Croatia. I got there just in time to see Croatia’s equalizer, which drew huge cheers from the (predominantly Irish) crowd, and decided to stay until the end. Croatia’s second goal got an even bigger cheer, though it wasn’t exactly a surprise even if it did take them until extra time to score it. From what I saw, Croatia thoroughly deserved to win. Congratulations to them. It has been a strange World Cup for England. With Germany, Argentina, Spain, Portugal and Brazil (and Italy not even qualifying) it seemed that the fates had paved a relatively easy route to the final. I do think, however, that people overestimated the quality of the England team: they lost to Belgium’s B-team in their last group game and only just scraped past Colombia in the following round. It’s true that they beat Sweden comfortably in the Quarter Final, but I thought that was more because Sweden were poor than because England were good. In the end I think Croatia won because England displayed a longstanding weakness of English teams – an inability to maintain possession of the ball in midfield. Against teams with good attacking players you just can’t afford to keep giving the ball away! They also seemed to get very rattled when Croatia equalized. On the other hand, this is a very young England side which promises much in the future. There’s plenty of time before the next World Cup for them to grow proper beards, for example. And one person who definitely deserves praise is manager Gareth Southgate, who has not only shown that he’s a pretty good tactician but also that he’s a very nice bloke, with a fine sense of sportsmanship. So football’s not coming home after all. But where will it go? I do fancy France to win it, but I hope it’s a good final. I have a feeling that the 3rd/4th playoff between England and Belgium might be a good game too! I see that, once again, questions are being raised in the English media about where The North begins. I see it as symptomatic of the decline of educational standards that this issue is still being discussed, when it was settled definitively several years ago. Let me once again put an end to the argument about what is The North and what isn’t. I think this map in itself proves beyond all reasonable doubt that`The North’ actually means Northumberland: the clue is in the name, really. 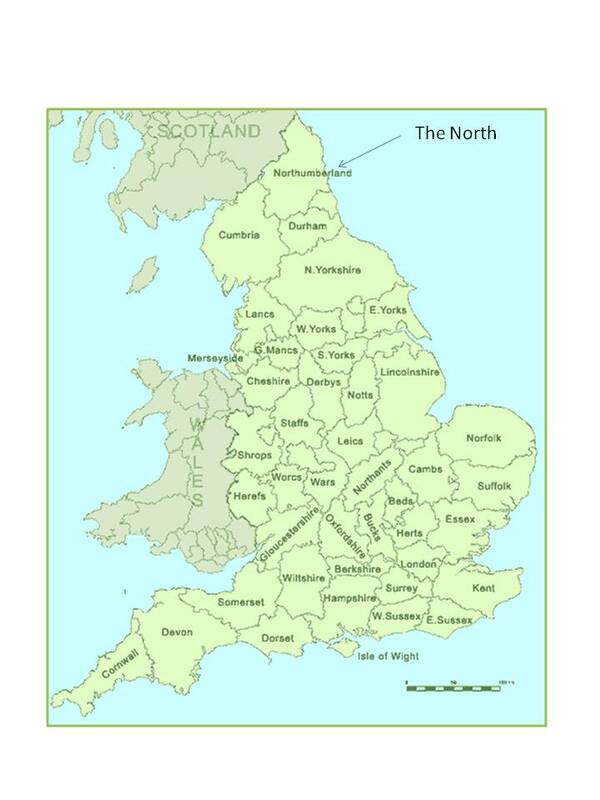 It is also abundantly clear that Manchester, Leeds, Liverpool, etc, are all much further South than The North. North Yorkshire isn’t in the North either, as any objective reading proves. All these places are actually in The Midlands. If you’re looking for a straightforward definition of where The North begins, I would suggest the most sensible choice is the River Tyne, which formed the old Southern boundary of Northumberland. The nameless County shown on the map between Northumberland and Durham is `Tyne & Wear’, a relatively recent invention which confuses the issue slightly, as including all of it in The North would be absurd. Surely everyone knows that Sunderland is in the Midlands? This particular one demonstrates beyond any doubt that Leeds is not in The North. 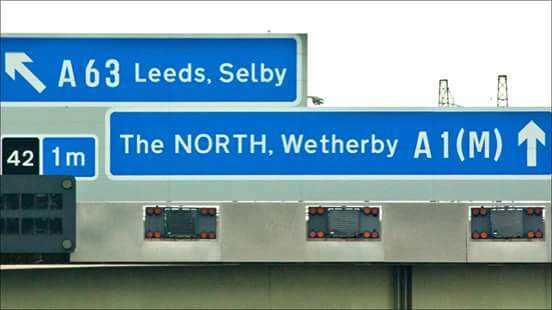 If you keep driving in a northerly direction you will continue to see signs of this type until you cross the River Tyne at Gateshead, at which point `The North’ disappears and is replaced by `Scotland’. It therefore stands to reason that The North begins at the River Tyne, and that the most northerly point of the Midlands is at Gateshead. So Alastair Cook has resigned from his post as Captain of the England (and Wales) Cricket team, having been skipper for 59 test matches since 2012. After their drubbing in India this is hardly surprising, but I hope he finds his form and continues as an opening batsman. He’s only 32 so should have a few more years in him. When he started as captain I felt that he was far too cautious, something perhaps he inherited from his predecessor Andrew Strauss. I think he got marginally better as time went by, but I always felt he didn’t have sufficient presence on the field to be a great team leader and too often let things drift when England were fielding. Anyway, I don’t want to be too harsh – he did lead England to two Ashes victories! Farewell, then, Alastair Cook. But who should take his place? Is it the youngster, Joe Root? Or should Geoffrey Boycott come out of retirement to wield his stick of rhubarb in the corridor of uncertainty once more? At the end of the 2015 Rugby World Cup, I wrote a post recalling the World Cup of 1995, which was held in South Africa while I was visiting there. I had the privilege of seeing the great Jonah Lomu demolishing the England defence that day. Today I learned with greant sadness that he has passed away, aged just 40. Since Jonah Lomu played such a central role in one of the most amazing sporting experiences of my life, which lives in my memory as if it happened yesterday, I wanted to take the opportunity to pay tribute to the awesome sportsman that he was by sharing that memory again. Jonah Lomu was unstoppable that day. One of the All Blacks later quipped that “Rugby is a team game. Fourteen players all know that their job is to give the ball to Jonah”. It was one-way traffic in the first half but England played much better in the second, with the result that all the action was again at the far end of the pitch. However, right at the end of the match Jonah Lomu scored another try, this time at the end I was standing. I’ll never forget the sight of that enormous man sprinting towards me and am glad it wasn’t my job to try to stop him, especially have seen what happened to Underwood, Catt and Carling when they tried to bring him down. Lomu scored four tries in that game, in one of the most memorable performances by any sportsman in any sport. It’s so sad that he has gone. It’s especially hard to believe that such a phenomenal athlete could be taken at such a young age. My thoughts are with his family and friends. So, the 2015 Rugby World Cup final takes place this weekend. It’s been an interesting tournament with some memorable games (and some notable disappointments). Anyway, I suddenly remembered that in 1995 I was in South Africa during the Rugby World Cup. 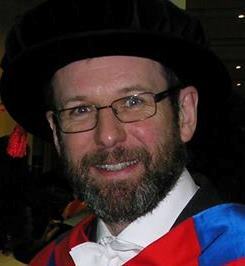 In fact I was visiting George Ellis at the University of Cape Town to work on a book, which was published in 1997. The book is now rather out of date, but I think it turned out rather well and it was certainly a lot of fun working on it! Was that really twenty years ago? Even more impressively I had a very good view when Zinzan Brooke scored at the same end with a drop-goal off the back of a scrum. Not many No. 8 forwards have the skill to do that! It was one-way traffic in the first half but in the second half England played much better, with the result that all the action was again at the far end of the pitch. However, right at the end of the match Jonah Lomu scored another try, this time at the end I was standing. I’ll never forget the sight of that enormous man sprinting towards me and am glad it wasn’t my job to try to stop him, especially have seen what happened to Underwood, Catt and Carling when they tried to bring him down. Anyway, I hope it’s a good final on Saturday. For what it’s worth, I did pick the two finalists correctly before the tournament. I’m expecting the All Blacks to beat Australia comfortably, but am not going to bet on the result! Well, there you have it. England’s cricketers have won the Fourth Test of the Ashes series at Trent Bridge (in the Midlands) by an innings and 78 runs, to take an unassailable 3-1 lead with one game to play. When I settled down to watch the opening overs of the opening match in Cardiff I really did not think England had any chance of winning the series, and even after England won in Cardiff I felt that the Australians would come back strongly. That horrible defeat at Lord’s in the Second Test confirmed that opinion, but emphatic victories in the Third and Fourth Test have proved me wrong. The amazing first day at Trent Bridge, during which Australia were all out for a meagre total of 60 with Broad taking 8-15, made an England victory and the Ashes virtually certain. It all just proves how little I know about cricket. At one point it looked like the game would be wrapped up yesterday, inside two days, but Adam Voges and the remaining Australian tailenders clung on doggedly in the fading light of yesterday evening to end the day on 241-7 in response to England’s first innings total of 391-9 declared. The main question this morning was whether they could accumulate the 90 runs needed to make England bat again. As it happened, neither Starc nor Hazlewood nor Lyon could cope with the swing of Wood and Stokes. Hazlewood in particular led a charmed life for 10 deliveries, during which he never really looked like putting bat to ball, before finally losing his middle stump to Wood. Moments later, Lyon fell in the same manner. In some ways it’s cruel sport when bowlers have to bat in a futile attempt to save a game that’s lost, but the end was mercifully swift. Nevill battled well to end on 51 not out, but he might have tried a bit harder to protect his tailenders. No doubt he was hoping a not out score would improve his chances of continued selection. Commiserations to Australian cricket fans. Their team just wasn’t as good as England, with bat or ball. They have a lot of rebuilding to do, and I think it won’t just be the Captain Michael Clarke who won’t be playing another Ashes series, but you can be sure they’ll be back challenging for the Ashes again before long. And as for England, there are some interesting questions about the next Test at the Oval. Will Jimmy Anderson return, or should England rest him even if he is fit? Does Adam Lyth get another chance to establish hismelf with the pressure off, or do England try to blood another opener? And although Moeen Ali is an excellent find as a batting all-rounder, he’s not the kind of bowler that’s likely to bowl a team out at Test level. Can we find a world-class spinner to balance the attack? Answers on a postcard, please. It’s been an extraordinary series so far, consisting of four relatively one-sided matches (three to England and one to Australia). A far cry from the brilliant Ashes series of 2005 which had so many close games, so I guess it’s not been such a great series for the neutral. But then I’m not neutral, so I don’t mind at all..